Hiyori Matsuzawa, a crewmember on the Sashimi II, prepared some fishing rods prior to a late-afternoon charter out of Kewalo. There is a proposed plan to make salt-water fishing licenses a requirement in Hawaii. A Fishers' Forum on a draft Recreational Fisheries Strategic Plan by the National Marine Fisheries Service will be held from 6 to 9 tonight at the Ala Moana Hotel, 410 Atkinson Drive. A copy of the draft plan and e-mail address for public comments is at: www.nmfs.noaa.gov/recfish. In a few years, when Juan Rodrigo heads to Kewalo Basin to cast for papio and weke, he could need a government license. The National Marine Fisheries Service is proposing a requirement for anglers in every coastal state to obtain a saltwater fishing license. The proposal is still in an early stage, without details about the cost or when fisherman might be required to obtain the permit. Rodrigo, who shoreline fishes a couple times a week, is against the idea. "To have a fishing license, I wouldn't vote for it," Rodrigo said as he prepared his hooks yesterday. "I think most fishermen will be against it." A recreational fishing license is one idea for better management of the nation's fishing grounds in the Fisheries Service's 15-page Recreational Fisheries Strategic Plan for 2004 to 2009. Others include creating a nationwide database of fisheries information and considering marine protected areas and artificial reefs. But for Hawaii -- one of three coastal states without a recreational salt-water fishing license -- it's the most controversial idea. Anglers can comment on the proposal at a forum from 6 to 9 tonight at the Ala Moana Hotel. Many, like charter operator Robert "Capt. Tiger" St. Romain, don't like it. "I don't think it's necessary. We pay enough in taxes already and they haven't been able to regulate half the rules they already have," St. Romain said yesterday at Kewalo Basin, home port for his Sashimi Fun Fishing tours. 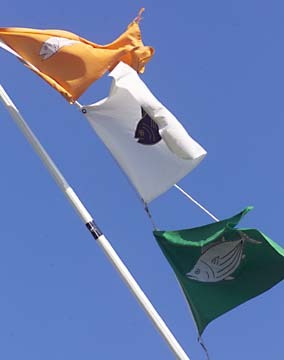 Fish flags flapped in the wind on a boat moored yesterday at Kewalo Basin. Not needing a fishing license is "one of the pleasures of coming to Hawaii and fishing," St. Romain said. "And local people are going to be in an uproar. They're not going to be happy." Hawaii commercial fishermen landed 25 million pounds of fish in 2002, while recreational fishers landed an estimated 13 million pounds, according to the Fisheries Service. Hawaii has a larger "gray area" of recreational fishers who sell some of their catch than do other states, fisheries service Director Bill Hogarth said. In most states, recreational fishers either release their catch or eat it themselves, he said. In Hawaii, large numbers of recreational anglers fish for sustenance, but sell the surplus. The state Division of Aquatic Resources, which oversees fishing regulations in waters up to three miles from shore, tried several times in recent years to get the Legislature to approve a marine fishing license, said Walter Ikehara, the division's program manager for commercial fisheries. The bills didn't pass, Ikehara said, "because people don't want to be licensed. They say it's their constitutional right to fish." Having recreational licenses would help the division gather more data to manage the resource, said Ikehara. "But that's not a viewpoint that's universally shared," he said. Even within the Division of Aquatic Resources, opinions differ on the merits of a saltwater fishing license, Administrator Bill Devick said. 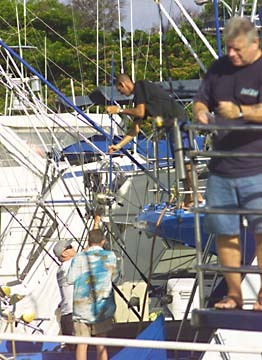 Charter boat crewmembers worked on their boats yesterday at Kewalo Basin. In 1948, the Territorial Legislature enacted a marine fishing license, but the public disliked it so much that the Legislature went into special session six months later and repealed it, Devick said. There hasn't been one since. "I wonder about the efficacy of imposing a charge for people to use the ocean," Devick said. "It seems like it would be hitting hardest at people who use the ocean the most." Hogarth, who is in Hawaii for tonight's meeting, said a license's main purpose is to allow fishery managers to poll known fishermen to see what they are catching. Hogarth said yesterday that he prefers that states create their own saltwater fishing license. But if the three coastal states without such licenses (Hawaii, North Carolina and New Jersey) don't establish licenses in a few years, the federal government will probably move to do it, he said. That's a shame, said Marc Moore, a Cheyenne Indian from Las Vegas who was going fishing on a Sashimi Fun Fishing charter yesterday. "For people that live here, that's part of their living," he said. "They've been catching fish here since creation." Another tourist on the boat, John Graham of Corpus Christi, Texas, said he gladly pays $45 a year for a Texas salt-water fishing license, because the proceeds are used to support hatcheries to restock popular fish.